Ancient Jewish quarters in Cairo, from the Fatimid period. After E. Ashtor, Toledot ha-Yehudim be-Miṣrayim ve-Suryah. had its own synagogue and received guidance from the leaders of the yeshivot in Iraq and Palestine. It is thought that the synagogue of the Palestinian community was the former Coptic Church acquired in 882. Some evidence shows, however, that the Coptic Church was acquired by the newcomers from Iraq, while the synagogue of the Palestinians was pre-Islamic, as reported by Muslim chroniclers. It was later known as the Synagogue of Ezra the Scribe and it was there that the famous *Genizah was discovered. The synagogue of the Babylonian community was in the same area, as was the synagogue of the Karaites, who had a large community in Fustat by the tenth century. After the conquest of Egypt by the Fatimid army in 969, the newer town of Cairo was founded north of Fustat. The Jews immediately settled there and built their synagogues. It seems that at first the Jews dwelt in two quarters: al-Jawdariyya in the southern part of the town, south of as-Sikka al-Jadīda Street; and in Zuwayla north of al-Jadīda and between it and Khurunfush Street. 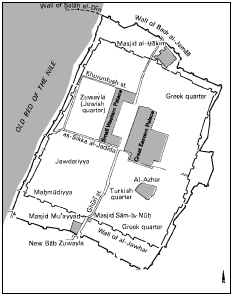 The Jews were removed from the al-Jawdariyya quarter by the caliph al-Ḥākim at the beginning of the eleventh century, and after that they were concentrated in the area north of it, which became known as the Jewish Quarter. The Karaites settled in the eastern section of the quarter, where they remained until modern times. At the end of the tenth century the community of Cairo became the religious and cultural center of all the communities in Egypt. *Shemariah b. Elhanan, a pupil of R. *Sherira Gaon, founded a Bet Midrash, which continued to exist after his death in 1011, but did not replace the Palestinian yeshivah till the end of the 11th century, when Palestine was occupied by the Crusaders. The leaders of Cairo-Fustat in the first half of the 11th century were distinguished scholars. In the Palestinian community they bore the title ḥaver, and in the Babylonian one, allūf. The Palestinian leader Ephraim b. Shemariah and the Babylonian leader *Sahlān b. Abraham wrote both religious and secular poetry. They were in close contact with the geonim of the yeshivot in Palestine and Babylon. *Maẓli'aḥ b. Solomonha-Kohen, a member of the Palestinian family which directed the yeshivah in Palestine as gaon, arrived in Cairo during the first half of the 12th century. He tried to found a yeshivah that would replace the Palestinian yeshivah. These efforts continued to exist until the end of the century (see Mann, Texts, 1 (1931), 255ff.). During the second half of the century, the yeshivah, was headed by *Nethanel b. Moses ha-Levi and later by his brother Sar Shalom ha-Levi. The 12th-century traveler *Benjamin of Tudela relates that when he visited Cairo there were 7,000 Jews there, but this figure seems to be an exaggeration as there were probably not more than 1,500 Jews in Cairo (see E. Ashtor's notes in JQR, 50 (1959/60), 57ff.). The second half of the 12th century marked the decline of Fustat. In 1168 the Egyptians set the town on fire to prevent its seizure by the Crusaders; after its destruction it was not restored to its former state. While some Jews remained in Fustat, many of them left for the new Cairo. It seems that Maimonides lived in Fustat in the years 1171–1204. Plan of Fustat showing Jewish quarter. After E. Ashtor, Toledot ha-Yehudim be-Mizrayim ve-Suryah. to Muslim authors, there were riots in Cairo during which the fanatical mob destroyed all non-Muslim homes that were higher than the Muslim ones. During the 15th century the sultans made even greater efforts to prove their piety by persecuting the non-Muslims, and Muslim records of that time give much information on the attacks against Jews and Christians. From time to time searches for wine were carried out in their neighborhoods, and all the barrels found were poured out into the street. The Muslim fanatics often directed their attention toward the synagogues, accusing the Jews of having built additions to the synagogues, which were forbidden according to Islamic law; detailed searches were carried out and senseless accusations were brought against them. In 1442 there was a general investigation of all non-Muslim places of worship to ascertain whether any new portions had been added to the buildings. As a result of the accusation that the Jews had written the name of Muhammad on the floor where the ḥazzan stood, the Muslims destroyed the almemar ("pulpit") of a synagogue in Fustat and maltreated the Jews. Later, the Muslim judges decided that a Karaite synagogue and a Rabbanite bet midrash in the Zuwayla neighborhood should be confiscated because they had been private houses that had been turned into places of worship without authorization. Finally, the government demanded a solemn promise from non-Muslims that no alterations would be made in any of their community buildings. During the reign of Sultan Ināl (1453–1461), after rumors had spread that the non-Muslims had built new places of worship, a further investigation took place. It was only rarely, as in 1473, that the Muslim authorities consented even to the repair of places of worship. During the whole of this period there existed a relatively powerful Karaite community in Cairo whose relations with the Rabbanites were not always good. A great dispute broke out between the two communities in 1465, when a newly arrived group of Spanish Marranos wanted to join the Karaites. The case was brought before the Muslim authorities and the son of the sultan tried to use the occasion to extort money from the Jews. However, the case was peacefully concluded; the two communities reached an agreement, and the sultan ordered his son not to interfere with the Jews. The Mamluk rule not only brought harsh legislation and persecution on the Jews of Cairo, but also barred most of them from commerce in spices and other Indian and Far Eastern products, which had become the monopoly of a wealthy group of merchants. The economic status of the Jews, who had been a middle class of artisans and merchants under the Fatimids and Ayyubids, was now undermined, even though there remained a small privileged group employed in the royal mint and in banking affairs. Meshullam of *Volterra, who was in Egypt in 1481, reports that at that time there were 800 Jewish households in Cairo, in addition to 150 Karaite and 50 Samaritan families. R. Obadiah of *Bertinoro, who visited Cairo in 1488, reports 500 Rabbanite families, 100 Karaite, and 50 Samaritan. According to the Muslim chronicler al-Maqrīzī (d. 1442), there were five synagogues in the new Cairo in the first half of the 15th century: two belonged to the Rabbanites, two to the Karaites, and one to the Samaritans. At the beginning of the 16th century many refugees came from Spain. Three distinct congregations were then formed: *Mustaʿrabs (native Arabic-speaking Jews), Maghribim (Jews of North African origin), and Spanish. Among these congregations, each of which had its own bet din and charitable institutions, there was occasional conflict, such as the great dispute of 1527 between the Mustaʿrabs and the Maghribim over precedents in the common synagogue. The Spanish exiles surpassed the other communities, both in Jewish scholarship and generally; their scholars were even appointed as rabbis in the other communities. Such was the case with R. Joseph Iskandari, who, although of Spanish origin, became rabbi of the Mustaʿrabs. Generally, in the course of time the Mustaʿrabs accepted the customs of the Spanish Jews in their prayers, while in time the descendants of the Spanish exiles became assimilated with the majority of the Jewish population and to a great extent stopped speaking Spanish. During the 16th century eminent scholars filled the rabbinical positions of Cairo. Most of them were of Spanish origin, but their halakhic decisions were universally accepted. During the first half of that century R. *David b. Solomon ibn Abi Zimra was the foremost rabbinical author in Cairo. R. Moses b. Isaac *Alashkar and R. Jacob *Berab were his contemporaries. After Ibn Abi Zimra emigrated to Palestine, R. Bezalel *Ashkenazi became the recognized authority. During the second half of the century, R. Jacob *Castro, R. Ḥayyim Kafusi, and R. Solomon di Trani lived in Cairo. The Turks, who conquered Egypt in 1517, did not usually interfere with the Jews in religious matters. Nevertheless, there were occasions when they were influenced by the accusations of the Muslim fanatics, as in 1545 when the central synagogue was closed down and not reopened until 1548. Also, Muslim mobs often attacked Jewish funeral processions on their way to the cemetery in Basātīn, some distance from the town. As a result, the dead were sometimes buried without procession, or the funerals were held at night, and at other times Muslim guards were hired. However, the greatest oppression of the Jews was economic. On the one hand, the Turkish governors delegated financial administration, such as the operation of the mint and the collection of taxes and customs to Jews, but on the other hand, they were jealous of the wealth of these Jewish bankers and from time to time maltreated them. The first such case occurred in 1524, when governor Ahmed Pasha extorted a large sum of money from Abraham *Castro, the director of the mint, and threatened to slaughter all the Jews of Cairo unless they provided him with a large sum of money. However, on the day appointed for payment, he was killed by some soldiers who opposed his plan to rebel against the sultan. This day of salvation was commemorated as an annual Purim Miẓrayim ("Purim of Egypt"). Often false accusations were brought against the Çelebis (treasury officials of the governors, who were also Jewish community leaders), and several of them were executed. Others were executed without any pretext. Many Cairo Jews who were closely related to these wealthy officials also suffered greatly. The tyranny and extortion of the Turkish governors worsened during the 17th and 18th centuries, and the process of decline and corruption in the Turkish government also had an effect on the condition of the large community in the capital of Egypt. The standard of Jewish learning fell, even though some of the community's rabbis were eminent halakhic authorities. The most important rabbis were the following: in the 17th century, Isaac Castro, Samuel *Vital (the son of R. Ḥayyim *Vital), Mordecai ha-Levi and his son Abraham; in the 18th century, Solomon *Algazi; and in the 19th century, Moses Algazi, Elijah Israel, his cousin Moses, and Raphael Aaron *Ben Simeon, author of the works Tuv Miẓrayim and Nehar Miẓrayim. In independent Egypt under Muhammad Ali (1805–48) a new era of development for the Jewish community began. In 1840 Moses *Montefiore, Adolphe *Crémieux, and Solomon *Munk visited Cairo, and founded schools in which Jewish youth were educated according to European standards. The economic development of Egypt attracted Jews from other Mediterranean countries, many of whom settled in Cairo. Even so, the number of Jews did not exceed 4,000 until the middle of the 19th century. In 1882 there were 5,000 Jews in Cairo, and by 1897, 10,000 including 1,000 Karaites. In 1917 there were approximately 29,000 Jews. Among these immigrants there were some Ashkenazi Jews from Eastern Europe who founded their own synagogue, but also collaborated with the existing community. The economic situation of the Jewish community improved and many of its members, such as the *Suarez, *Mosseri, and Cicurel families, prospered in commerce and banking. The greater part of the community moved from the ancient Jewish quarter and built houses in the newer districts of Zamālik, Heliopolis, and the "Garden City." The Jews became active in public affairs and some of them were appointed to the legislative assemblies and government institutions. R. Yom Tov Israel was appointed to the Legislative Assembly by Khedive Ismail Pasha, and Jacob *Cattaui became the khedive's private banker and the chief revenue officer of Egypt. His son Joseph became minister of finance in 1923, while another son Moses was president of the Cairo community for 40 years. Chief Rabbi Haim *Nahoum was appointed a member of the Egyptian Academy of Science in 1925. The Zionist movement found supporters among the Jews of Cairo. From the beginning of the 20th century Zionist societies and newspapers were established in the city. In 1900 the weekly newspaper Miẓrayim ("Egypt") was published in Ladino, in 1907–08 the Yiddish periodical Die Zeit appeared, and in 1908 the French weekly L'Aurore was founded. The last appeared until World War II. In 1919 the French weekly Israel was founded and in 1939 it amalgamated with the La Tribune Juive, which was published in Alexandria until 1948. From 1934 to 1948 there was also an Arab weekly, al-Shams. The Karaite community published the Arabic weekly al-Kalīm from 1945. Mann, Egypt; Ashtor, Toledot; J.M. Landau, Jews in Nineteenth-Century Egypt (1969); Ben-Ze'ev, in: Sefunot, 1 (1956), 7–24; A. Yaari, Ha-Defus ha-Ivri be-Arẓot ha-Mizraḥ, 1 (1937), 53–55, 57–67; idem, in: KS, 24 (1947/48), 67–69; H.D. Friedberg, Toledot ha-Defus ha-Ivri be-Italyah ve-Togarmah, 2 (1956), 45; Cowley, in: Festschrift… A. Freimann (1935), 89f. ADD. BIBLIOGRAPHY: S.D. Goitein, A Mediterranean Society, 6 vols. (1967–93); Y. Meital, Jewish Sites in Egypt (1995); E. Bareket, Fustat on the Nile (1999).